The Quantum Hall Resistance system provides an absolute value of resistance related to the von Klitzing constant of 25812.807Ohms. To provide this reference, a Quantum Hall semiconducting device is maintained at 0.3K with a He-3 refrigerator in a magnetic field of up to 14 Tesla, generated by a superconducting magnet. Under these conditions the Quantum Hall plateaux of resistance are easily obtained. Cryogenic offers QHR reference standard with its own Cryogenic platform consisting of a QHR sample, a Variable Temperature Insert temperature, a magnet with up to 16 Tesla magnetic field, magnet power supply, temperature controller, and oil free mechanical pump as a complete system. 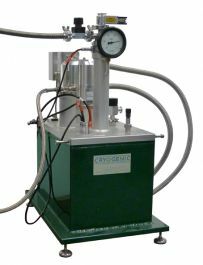 Cryogenic is now able to offer the QHR system in completely liquid helium free environment. The system is cooled by a pulse-tube cryocooler, for low vibration and low maintenance (every three years). The system has a special built-in facility for liquefying helium gas from room temperature (no cryogens required for start-up or operation). The miniature cryogen free QHR system up to 9 Tesla is also available suited for graphene measurements requiring lower magnetic fields.